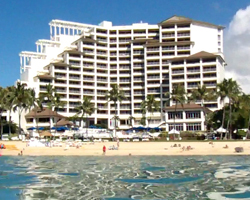 Beachfront Oahu Hotels Beyond the Borders of Waikiki! At present, Ko Olina Resort is home to the only Oahu hotels on the west side of the island. The major advantage of staying here is the climate. Whereas it could be raining everywhere else, the chances are fairly good that Ko Olina will stay dry. Meanwhile, a secondary advantage is that this is the newest resort area on Oahu. The development is still ongoing; but it’s planned rather than crammed. Ko Olina is a bit remote – 45 km/28 miles from all the activities in and around Waikiki/Honolulu. 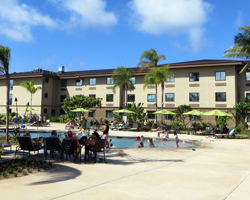 These Oahu hotels are located on the outskirts of Kapolei town just past the southern tip of Oahu on the island’s west shore (due west from Pearl Harbor). This location allows for open spaces, smaller crowds, and a more laid-back Hawaii vacation experience. Check Rates and Availability at Hotels.com (ad). Hawaii Vacations: Save 30% or more in paradise! : search keyword "Four Seasons Oahu". Formerly known as the Ihilani Resort, the newly renovated Four Seasons Resort Oahu at Ko Olina offers all the luxury and exclusivity you expect from Four Seasons. As far as beachfront Oahu hotels are concerned, I’d say this one ranks among the best – and you pay for the best. I can’t really afford to stay here as a guest, but I’ve been to various events on the property (before the renovation). Each of these experiences was very pleasant, and the facilities were grand. Now, I suspect everything is even more amazing. Check Rates and Availability at Hotels.com (ad). Hawaii Vacations: Save 30% or more in paradise! : search keyword "Aulani". 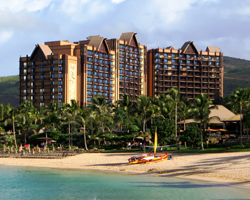 The Disney Aulani Hotel is a Hawaii attraction in and of itself. For that reason, I created an entire page dedicated to the adventures of Aulani. Please follow the link there for much more specific information about this west Oahu, Hawaii lodging option. Aulani is located next door to Ihilani. First, I need to tell you that this hotel is NOT located on the beach, and it’s NOT in the Ko Olina resort. This is a brand new hotel that doesn’t fit any other category on my site. It is closer to Ko Olina resort than any of the hotels that follow; and it is three miles from White Plains Beach. It’s directly next door to a brand new shopping mall, so there are plenty of nearby places to eat, shop, or watch movies; but it’s not what I would consider the ideal Hawaii vacation location. However, if I was traveling to Oahu for business at somewhere like Pearl Harbor or Schofield Barracks, this is the first place I would consider. It’s also literally down the road from the University of Hawaii West Oahu; and if we ever finish construction on our poorly-planned rail system, the start of the line will also be nearby. Finally, if you’re a golfer, there are approximately 10 different golf courses in the nearby area. Check Rates and Availability at Hotels.com (ad). Hawaii Vacations: Save 30% or more in paradise! : search keyword "Kahala Hotel". 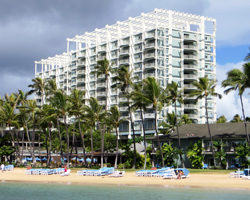 Of all the beachfront Oahu hotels discussed on this page, The Kahala Hotel & Resort is located closest to Waikiki – approximately 7 km/4.5 miles behind Diamond Head crater in the well-to-do east Honolulu neighborhood of Kahala. 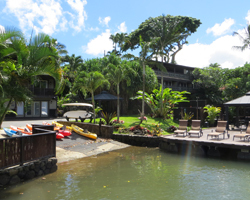 With spectacular views over Kahala Beach and the Waialae Country Club, the location is quite scenic. I’ve been to this hotel for up-scale events; and I’ve always left with the impression that it’s very posh. It also seems to be a good place for watching celebrities… I’ve run into a few different rock stars and actors during my strolls through the lobby. 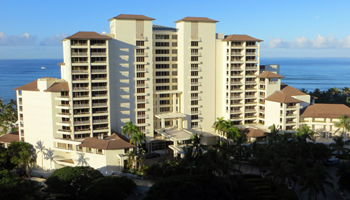 This hotel is home to Dolphin Quest Oahu, where you can swim with dolphins on site. As for Hawaii visitor attractions in the area, there’s Diamond Head and numerous other things to do in Waikiki. You’ll find convenient shopping at Kahala Mall; and you’ll be just a short drive from Hanauma Bay, Sea Life Park, and many other Hawaii tourism activities on the eastern tip of Oahu. Check Rates and Availability at Hotels.com (ad). Hawaii Vacations: Save 30% or more in paradise! : search keyword "Turtle Bay Kahuku". Located 60 km/38 miles from the Honolulu International Airport and 72 km/47 miles from the buzz of central Waikiki, the Turtle Bay Resort is just about as remote as any Oahu hotels can get. 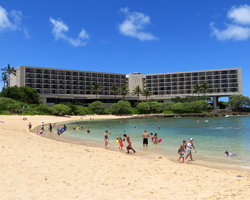 For that reason, I’ve enjoyed staycations here a handful of times (many years ago when it was the Turtle Bay Hilton). Back then, the guest rooms seemed nice but not necessarily sumptuous. Unfortunately, I don’t have any recent experience as a guest, so I can’t speak knowledgeably about the current guest amenities. 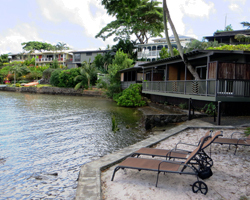 What I can highlight for you is the awesome location on Oahu’s world-famous north shore. If you’re going to visit us in the winter, and you want to watch the Triple Crown of Surfing or other big surf, this is the place to stay! The surrounding area is also excellent for humpback whale watching in the spring and snorkeling in the summer. Then, for the landlubbers, Turtle Bay Resort offers two championship golf courses designed by legendary PGA pros! Besides the resort recreation and nearby beaches, there’s not much else of interest to visitors in the immediate vicinity. You may want to take a windward Oahu scenic drive for some unique Hawaii sightseeing; and you’ll probably make numerous trips 19 km/12 miles down the coast to the shops and restaurants of Haleiwa town (or beyond). Check Rates and Availability at Hotels.com (ad). Hawaii Vacations: Save 30% or more in paradise! 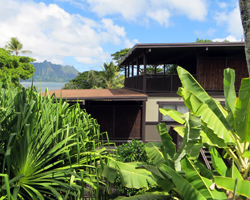 : search keyword "Paradise Bay Kaneohe". First the great news: no other Oahu hotels offer a view quite as stunning as what you’ll find at Paradise Bay! So if you’re looking for a writer’s retreat or somewhere you can just kick back in the country, this is your secret spot. Furthermore, the hotel is under new management. As a result, I’ve been hearing some good things about improved customer service and long-overdue renovations. Under the previous management, I would have warned you to stay away. Not so anymore. Now for the eye-openers: Paradise Bay Resort is definitely out in the country – within walking distance of almost nothing (other than my parents’ house). Look up the address using the Google Maps street view feature, and then use your cursor to do a virtual “walk” up the street. It’s a good neighborhood. I grew up there; and I can vouch for the niceness of the neighbors. Heck… one neighbor gave me lilikoi (passion fruit) while I was out taking these pictures. Nevertheless, you need to know that there’s not a souvenir shop for miles in any direction. The few Hawaii visitor attractions within 5 km/3 miles include the Byodo-In Temple at the Valley of the Temples, the Puu Maelieli trail (one of my favorite Hawaii hikes), and the first two stops on my recommended windward Oahu scenic drive. You’ll probably make many trips 7 km/4 miles up the road to the shops and restaurants in and around Windward Mall/Kaneohe town (or beyond). And although municipal bus service is available, the busses usually run only once every 30 to 45 minutes. Furthermore, the Kahaluu area is on the rainy side of the island. You could get soaked just waiting for a bus. As someone who rode the bus and got on/off at the very same bus stops almost every day of my youth, I urge you to rent a car if you’ll be staying here. As for the beach, it’s really more of a tidal mud flat – complete with mangroves. I used to wade out to the reef and go snorkeling in this area, but I don’t know if you’ll want to go to all that trouble. I have seen, however, that the hotel has kayaks on site, and Kaneohe Bay is often excellent for kayaking and/or boating. 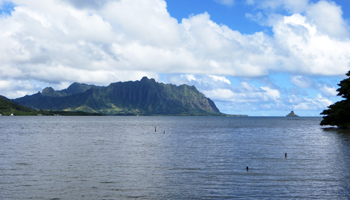 Meanwhile, the georgeous beach photo shown on the hotel web site is the Kaneohe Bay Sandbar, which requires access to a boat. So if you intend for the beach to be a major part of your Hawaii vacation itinerary, first read about the nearby east shore beaches. Check Rates and Availability at Hotels.com (ad). Hawaii Vacations: Save 30% or more in paradise! : search keyword "Courtyard Laie". 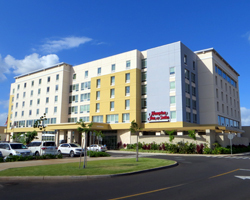 The Courtyard by Marriott Laie Hotel opened in mid-2015 directly next door to the Polynesian Cultural Center. It's also directly across the street from a beautiful strip of east shore beach near Malaekahana and a short stroll from the Laie Hawaii Temple and Laie Point. Just be aware that these are virtually all the nearby attractions that would be of any interest to a Hawaii vacationer. This is definitely one of the most remote of all Oahu hotels. There’s a municipal bus route going right through the area, but you really should rent a car. Unless you’re looking specifically to revel in the isolation, you’re going to want to get out and about. There are very few dining options in the immediate area, so you’ll probably be making regular restaurant and shopping trips 30 km/18 miles down the road to Haleiwa town or 34 km/21 miles in the opposite direction to Windward Mall/Kaneohe. 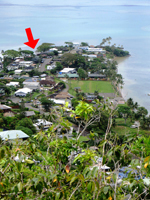 Then, because practically the entire town of Laie is somehow affiliated with the Church of Jesus Christ of Latter Day Saints, you’ll find that it’s a great little community… with absolutely no night life. The Makaha Resort is currently closed for renovation; but the on-site golf course remains open for play. I’ve read conflicting reports about when or if the resort will re-open. All I can say for sure is that the last time I was out there, in the summer of 2014, everything except the golf course was closed up tight. If they do re-open in the future, I’ll post the good news here. In the meantime, you should consider staying at one of the west Oahu hotels in the Ko Olina Resort. **Rates obtained per above for October 15-21 2015, and the following dates in 2016: January 15-21, April 15-21, and July 15-21. ***Due to change of hotel management, rates were obtained in February 2017 for the following dates in 2017: April 15-21, July 15-21, and October 15-21; and rates were also obtained for the following dates in 2018: January 15-21. †New hotel. Sample Rates were obtained in May 2017 for the following dates in 2017: July 15-21 and October 15-21; and rates were also obtained for the following dates in 2018: January 15-21 and April 15-21.